Nonlinear electric devices are important and essential for setting circuits so that chaotic outputs or periodical series can be generated. 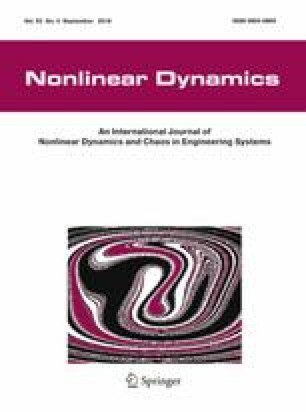 Chaotic circuits can be mapped into dimensionless dynamical systems by using scale transformation, and thus, synchronization control can be further investigated in numerical way. In case of synchronization approach, resistor is often used to bridge two chaotic circuits and gap junction connection is used to realize possible synchronization. In fact, complex electromagnetic effect in circuits should be considered when the capacitor and inductor (inductance coil) are attacked by high-frequency signals or noise-like disturbance. In this paper, two chaotic circuits are connected by using voltage coupling (via resistor) and triggering mutual induction electromotive force, which time-varying magnetic field is generated in the inductance coils. Therefore, magnetic field coupling is realized between two isolate inductance coils and induction electromotive force is generated to adjust the oscillation in circuits. It is found that field coupling can modulate the synchronization behaviors of chaotic circuits. In case of periodical oscillating state, the synchronization between two periodical circuits under voltage coupling is destroyed when field coupling is considered. Furthermore, the synchronization between chaotic circuits becomes more difficult when field coupling is triggered. Open problems for this topic are proposed for further investigation. This project is supported by National Natural Science Foundation of China under Grants. 11672122, 11765011. The authors would like to thank Ms. Lulu Lu for her help in producing Fig. 3.